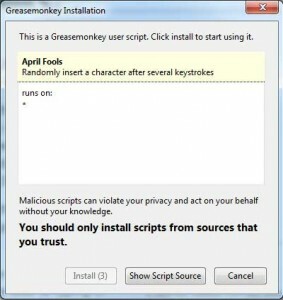 The first step of our prank involves installing GreaseMonkey onto the users (hereto referred to as “The Target”) computer. 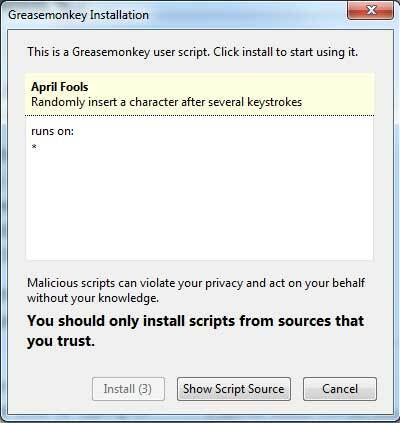 Keep in mind that if the user doesn’t have Firefox, then this whole prank falls apart. Fire up Firefox and point the browser to https://addons.mozilla.org/en-US/firefox/addon/greasemonkey/ and click on the ‘Add To Firefox’ button to install GreaseMonkey into Firefox. You may need to restart the browser. * Count every keypress. If between 50 and 100 keypresses, add a random character. //get the element that is currently being typed into, then append the random character.